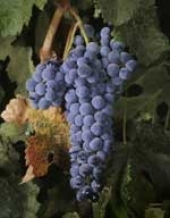 A cluster of merlot winegrapes. Last July, when the summer's most ferocious wildfires near wine country were still smoldering, Wine Spectator magazine suggested the 2008 vintage could be tainted by the smoke. An article in today's Santa Rosa Press-Democrat seems to confirm that the magazine's early prediction is coming to fruition, at least in Mendocino County. Unusually warm late summer temperatures in Sonoma County have grapes ready for harvest a bit early this year, causing some angst for wineries used to a longer break between the harvest of white and red varieties, according to a story in today's Santa Rosa Press Democrat. But UC Cooperative Extension viticulture farm advisor Rhonda Smith assured the paper that the 2008 vintage isn't suffering. Smith attributes the warmer harvest season to a lack of fog. A story in the Sacramento Business Journal about a common fantasy in the workaday world - quitting one's job and starting a winery - was informed by UC Cooperative Extension research. And the bottom line is sobering. The story says it will cost $4.5 million to get the winery going and keep the business running through the first three years. If you want to make your own wine, "plan on spending another several hundred thousand dollars to start a small winery," the story said. Cooler weather in California is helping firefighters begin to get a handle on fires that have raged in the state for weeks. But concerns over the fires' consequences are sure to continue for months. Two articles over the weekend touched on such issues. The Wine Spectator magazine raised the spector of 2008 vintage wines being imparted with a smoky character due to the fires. "There are examples of smokiness from forest fires showing up in wines," the story quoted Roger Boulton, a viticulture and enology professor at UC Davis. The San Francisco Chronicle today ran a lengthy story about the trend in California vineyards toward more sustainable farming practices.